At the suggestion of St Augustine, Paulus Orosius, wrote the first universal Christian history, finishing it in 418. It is divided into seven books: the first covers the period from the Creation and the Flood to the founding of Rome, and much of the remainder concentrates on Rome. 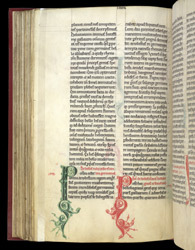 This manuscript (which also contains others historical works) was probably written at, and certainly owned by, the Cistercian abbey at Rievaulx, Yorkshire. The similarity of the decoration of these two initial 'P's may be taken to indicate that the artist was able to produce a limited range of ornamental features, or that, in his eyes, uniformity was a virtue. The limited variety probably is related to the austere ideals of the Cistercians, who had nothing against beauty but were opposed to excessive decoration.